It has been a long day and it's time to unwind with friends, family or co-workers. 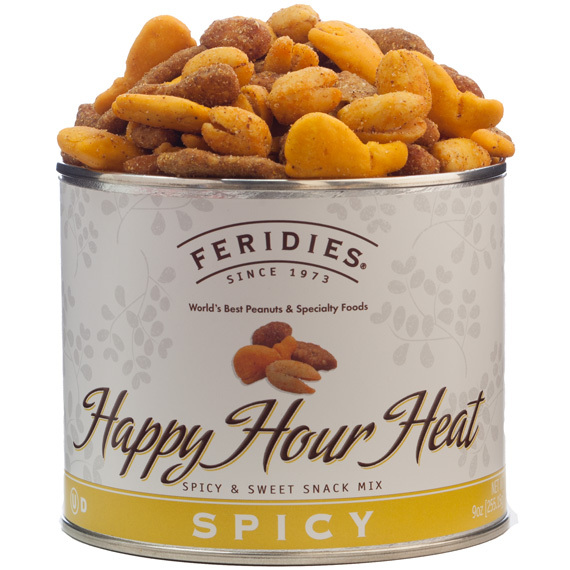 Grab your favorite beverage, sit back, relax and enjoy this spicy bar mix of hot and spicy Virginia peanuts, roasted pepper sesame sticks, cheddar cheese crackers and honey roasted Virginia peanuts. The dimension of the 9 oz. can is 4" x 3.25". Shelf life is approximately 1 year. OU Dairy Kosher Certified. 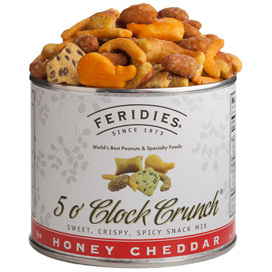 This crunchy mix probably got its name because it is such a good happy hour/bar snack, which it is, but it is so much better than the usual. It is not too salty and because it has such a nice variety of sweet and salty tidbits, it's ideal for anytime snacking, like a good trailmix. You get a lot for the price.